* Individual results may vary and results are not guaranteed. Patient photos courtesy of South Coast MedSpa unless otherwise stated. Over time, our skin undergoes environmental damage causing pigmentation and acne scars. Most of this damage is on the outer layer of the skin. By using the SCMS laser acne scar removal treatments, we are able to get rid of this outer damage with a fractional CO2 laser. Click here to learn more about laser acne scar removal at SCMS. The beautiful Suttee absolutely radiates following her acne scar resurfacing treatments at South Coast MedSpa. After only two profractional laser resurfacing treatments she felt her complexion was perfect. Actual SCMS patients describe their experience. These 10 actual SCMS patients talk about the amazing experience and life-changing results from South Coast MedSpa Laser Acne Scar Resurfacing. Profractional Laser Acne Scar Removal Before and After Pictures Plus Testimonial. Time to face the world - Get laser acne scar removal today! Actual SCMS Patient Sherry Landry urges all sufferers to contact South Coast MedSpa. Laser Acne Scar Removal from South Coast MedSpa can improve the texture, color, and overall appearance of your skin. This patient is having her Micro Laser Peel with a Pro Fractional Laser Treatment at South Coast MedSpa. You can see her actual before and after pictures. Acne Laser Therapy with the Profractional laser at South Coast MedSpa. This male in his young 20's describes why he decided to have acne scar removal treatments at SCMS. This video documents his first treatment before, during and after the treatment. Visit SouthCoastMedSpa .com to see his before and after pictures. Cort describes why he decided to fly to California to have his active fx treatments from Kansas City. Cort talks about the results he experienced from his 1st Active Fx treatment, and why he decided to have a Total Fx treatment documented here in this video. Javier was bullied in high school due to his acne and came to SCMS to get rid of his scars and the awful memories. Kathy joins SCMS for her first treatment and already has a noticeable improvement. Jeremy is certain that SCMS will help him overcome several obstacles in his life! John is excited for his second treatment after the first went so well. Scott comes to SCMS to erase the acne scars that have always bothered him. Arial came to SCMS from Northern California because he, "was getting tired of being treated differently." LA Before and After Acne Scar Removal! Cecilia shares her experience after her third treatment. Six patients share their experience with SCMS! Scottish Woman Travels for Laser Skin Rejuvenation! Rachel explains how her extensive research led her to travel to SCMS in Orange County for Skin Rejuvenation. Amazing Laser Acne Scar Removal Results! Our new Vietnamese TV Spot! Darcy is happy to start her Laser Acne Removal treatments- she worried that she would always have to live with her acne scars but now she is on the road to feeling more comfortable in her own skin. Kristian travelled all the way from Portland, OR to sunny Callifornia for Acne Scar Resurfacing procedure. The laser used on Kristian was the Total FX laser which is typically used for fair skin tones while the Profractional Laser would be used for darker or olive skin tones. Michelle is here at SCMS for a MicroLaserPeel for a quick and effective improvement to her skin. Check it out! Check out Grace's results after just 1 treatment! Chris is tired of looking in the mirror and only seeing acne scars. SCMS is the cure! Antonio is here to regain his confidence! Patient travels from Scotland for Laser Skin Rejuvenation! Rachel has traveled from Scotland to CA for a refreshed look! Ashleigh is explains the amazing results she has seen after 2 treatments. Penny says "It would be a dream to be able to walk out of the house without makeup!" Ashmina is back at SCMS and explains how she is more than satisfied with her results. James picked SCMS for "quality" treatment. Lisa recommends South Coast MedSpa because "They make you feel comfortable!" Peter has traveled from San Jose knowing that SCMS will get rid of his acne scars. Look Younger with Laser Skin Rejuvenation! Beth is here to freshen up her skin with laser skin rejuvenation! Sue is excited to see her amazing results from laser skin resurfacing! Rick has made the mission from Fresno,CA to eliminate his acne scars! Orange County local, Ruben, stopped by South Coast MedSpa to remove those unwanted acne scars. Check it out! Edward is determined to get rid of his acne scars! Patients explain that a 500 mile drive or 5 hour plane flight won't keep them from choosing South Coast MedSpa. "It didn't take much research to know South Coast MedSpa is the leading alternative!" Mili is a LA resident who came to South Coast MedSpa to get rid of those unwanted acne scars. John has finally come across a technology that works! JJ says "No pain. No gain!" Grace can't wait for her acne scars to be gone! Anthony has traveled all the way from Colorado and now "FEELS LIKE A BRAND NEW PERSON!" "My Doctor says I look 8 years younger!" Susan is here at South Coast MedSpa for her first laser acne scar removal treatment. 10 patients share how acne scar removal has changed their lives. Jesus says he's getting acne scar removal "to make ME feel better"
Gordon traveled 1,500 miles for Acne Scar Removal! Gordon has come all the way from Arkansas for his first laser acne scar removal treatment in hopes to regain his confidence back. Ashmina explains that not only did her friends notice the difference of her acne scar results during a Sunday brunch but, how the previously dreaded photos proved her fantastic results! Check it out! Justin describes how his laser for acne scars treatments has helped him regain his identity. Justing has had 3 laser for acne scar treatments at South Coast MedSpa. Melissa came to South Coast Med Spa for laser acne scar removal and said "I definitely see the 20-30%" difference after just one treatment. Ashmina is here at South Coast Med Spa for her first laser acne scar removal treatment. Becky gives a testimonial about how having acne scar removal done at South Coast Med Spa had affected her confidence and way of life. Mai talks about the vast improvement she has seen in her skin after several treatments at South Coast Med Spa. See part of the procedure and hear Mai talk about how painless it truly is. South Coast's world-renowned reputation brought Bill all the way from Springfield, Illinois for his laser acne resurfacing treatment. Laila has an Acne scar removal procedure and discusses how it went. This patient had amazing results from laser acne scar removal at SCMS. To see her before and after photos, click here. Fractional laser resurfacing using the erbium deep penetrating laser at South Coast MedSpa. The young man is 24 years old and is having his first treatment. Visit SouthCoastMedSpa.com to see his before and after pics. 23 year old Joseph talks about why he flies into Newport Beach CA from his hometown of Denver, CO to have his laser treatments at SCMS. He describes a 25% improvement from his initial Active Fx treatment. This video chronicles his 2nd treatment which is a Total Fx treatment. This patient decided to visit South Coast MedSpa after watching videos of the procedure on our website. In this laser treatment, SCMS's Total FX Fractional procedures ablation removes surface discolorations and deposits. Skin resurfacuing on Asian female patient. Painless skin resurfacing is performed on a young Asian female patient. This procedure will erase signs of acne scarring and other damage. Skin resurfacing performed on a young Asian male. The best technology is used to resurface the skin removing acne scarring and other damage. Male SCMS patient has his face resurfaced using targeted laser pulses. A young Asian male goes through the process of skin resurfacing. This will remove acne scarring and other skin damage to the treated area. Acne Scar Removal - Male patient receives laser acne scar removal. This video demonstrates a laser acne scar removal procedure with an actual South Coast MedSpa Patient. The lasers at South Coast MedSpa are rated to treat patients of all skin types. This asian patient experienced excellent results after just 1 treatment. At South Coast MedSpa, we use state-of-the-art laser equipment to make it possible for nearly everyone to take advantage of this safe laser skin resurfacing. This video demonstrates a laser acne scar removal procedure with an actual South Coast MedSpa Patient. Laser acne scar removal procedure. Pure ablative technology resurfaces skin through targeted laser pulses. Watch this video of an actual South Coast MedSpa patient undergoing a laser acne scar removal procedure. The phenomenal acne removal results achieved for this patient made him feel emotional. Laser acne scar removal treatments at South Coast MedSpa are safe and effective. The phenomenal acne removal results achieved for this patient made him very emotional. Get rid of those acne scars at South Coast MedSpa with our laser acne scar removal treatments. This 26 year old, hispanic, male patient began suffering from acne at age 16. He is receiving Laser Acne Scar Removal treatments from South Coast MedSpa in Orange County. This male patient with Type 2 skin is having a series of Laser Acne Scar Removal treatments from South Coast MedSpa in Los Angeles. 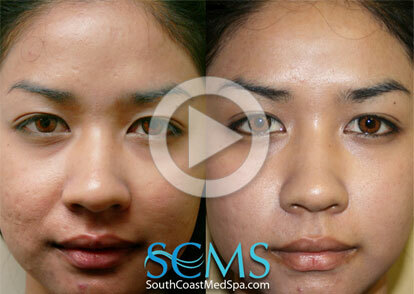 This female patient is undergoing the Laser Acne Scar Removal treatments at South Coast MedSpa in Southern California. Notice the deep acne scars on this Hispanic patient. This is the first of three acne scar removal treatments he will be receiving at South Coast MedSpa in Newport Beach, CA. This patient had a mix of acne scars and active acne. He experienced excellent results from the Active FX laser acne removal treatments at South Coast MedSpa in Orange County. South Coast MedSpa has successfully treated patients with active acne using their Active FX laser resurfacing treatments. This patient experienced phenomenal results from his Laser Acne Scar Removal treatments at South Coast MedSpa. This is a laser resurfacing treatment performed at South Coast MedSpa in Newport Beach, CA for a patient that had acne scars. This patient has experienced excellent results from the Active FX laser resurfacing treatments at South Coast MedSpa in Southern California. This older, middle eastern patient is receiving a Laser Acne Scar Removal and Skin Tightening treatment from South Coast MedSpa in Orange County. This is a South Coast MedSpa patient undergoing a laser acne scar removal treatment. Many patients of all skin types get their acne scars permanently removed at South Coast MedSpa. Watch this Philipino patient as he gets his second Active FX fractional CO2 laser treatment for acne scar removal.